Gothenburg, Sweden, March 13, 1999. 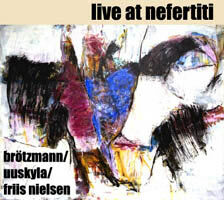 The Brötzmann/Uuskyla/Friis Nielsen Trio plays non-rehearsed music, never tried before. There are no agreements between the musicians before they start playing. Brötzmann just puts the saxophone to his mouth, and off they go. There's nothing secret about this music, no hidden agenda. The Trio shares a common language: the free jazz tradition from the 60's, the Cry of Freedom once heard for the first time from players like Albert Ayler, Cecil Taylor, Ornette Coleman, Frank Wright, John Coltrane and Archie Shepp. Peter Brötzmann was one of the European founders of that tradition but there is nothing “traditional” about the music on this CD. This is new music, created in the moment you hear it. Just open your ears and listen!